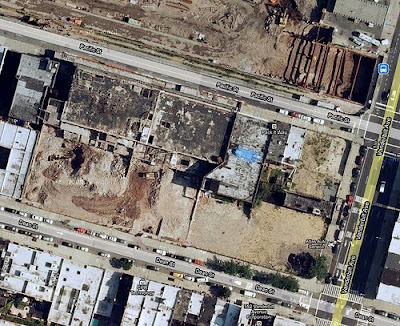 Photographer Tracy Collins has been uploading Atlantic Yards site photos from Google Maps and adding some helpful information. Above is one example. Go to Collins's annotations to learn, for example, his estimate that the photo was taken sometime in August 2008, given that the Ward Bread Bakery is half demolished--its top (Pacific Street) side seemingly intact, its bottom (Dean Street) side gone. Now it's all gone except for a (still handsome) segment used for storage.